I got this gazpacho recipe from a friend in Spain, at the same time he taught me to make seafood paella, actually. It took me a long time to make gazpacho, clearly, but once I finally did, I felt like an idiot for waiting so long. 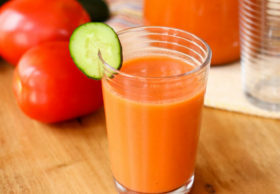 If you live in one of those “hotter than Hades” climates, you will appreciate a cold glass of gazpacho more than anyone. And if you can get some ripe, red homegrown tomatoes to make it with, then you’ll be even better for it. This gazpacho was titled Gazpacho Andaluz, or Andalucian gazpacho, and it doesn’t have bread in it. All the recipes I’d seen included some bread, for texture I imagine, but this one has no bread but relies on the emulsification of olive oil to thicken it. It becomes almost like a salad you can drink, or like a really, really, really good version of V-8. 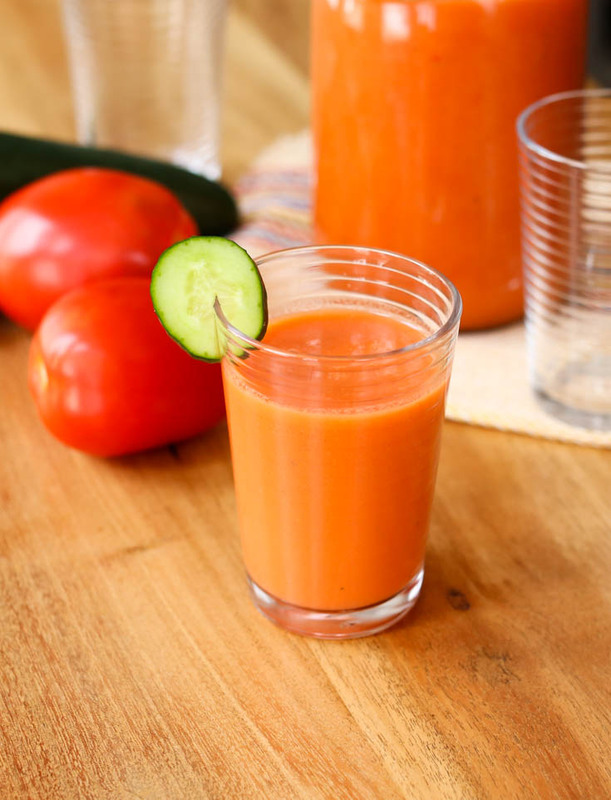 Gazpacho keeps in the fridge for up to a week, but I bet you’ll finish it before then. It may separate but just give it a stir before serving. If you like, you can serve it as a cold soup in the traditional way, topped with finely diced vegetables (onion, bell pepper and cucumber) and a few croutons. A thermos of cold gazpacho would also be nice to take along on a picnic of sandwiches or charcuterie. Don’t forget the sangria! Core tomatoes and pepper; peel cucumber. Coarsely chop all. Puree everything except the oil in a blender. With the blender running, add the oil slowly to emulsify. Strain and refrigerate until cold. I love the simplicity of this recipe! Tomatoes and cucumbers are already on my shopping list for tomorrow! Back in 1988, Pedro Almodovar’s Women on the Verge of a Nervous Breakdown was released and the guys in my little group of film geek friends became huge gazpacho fanatics either because of or despite the enormous allure of Carmen Maura. For some reason, the women in the group were more interested in Antonio Banderas. I wish I could say that making gazpacho for the ladies won their hearts, but that damned Banderas dude has some sort of serious mojo that gazpacho couldn’t compete with. I should see that movie! I’ve been trying to think of movies in which food plays a significant role, so if you know any more let me know! Skin and sieve tomatoes. Finely dice vegetables. Finely dice white and scrape egg yolks. Measure vinagar, oil, and herbs. 1. Rub bowl with cut garlic clove. 2. Stir in remaining ingredients except eggs. 3. Gently fold in egg whites then yolks. Chill 2 hours. Oh wow! That’s much more complex than this recipe. Sounds good, though. Thanks for sharing, Paul! The one you posted looks like it would taste great! I love dicing vegetables so it’s not a big deal, bu definitely going to try this! I like to top gazpacho with a couple of cooked, diced shrimp. That’s a great idea, Sally!